Climate Central reviews a recent paper that shows the Arctic's boreal forests are burning at a rate unprecedented for the last 10,000 years. Global warming has led to increased burning, which itself produces feedback. But the tree species that have moved into recently-burned parts of the boreal forest have tended to be less flammable deciduous species. This vegetation change, the study found, could eventually exert a negative feedback on future wildfire severity and frequency. The paper itself, which was published in March, is behind a paywall here. Wildfire activity in boreal forests is anticipated to increase dramatically, with far-reaching ecological and socioeconomic consequences. Paleorecords are indispensible for elucidating boreal fire regime dynamics under changing climate, because fire return intervals and successional cycles in these ecosystems occur over decadal to centennial timescales. We present charcoal records from 14 lakes in the Yukon Flats of interior Alaska, one of the most flammable ecoregions of the boreal forest biome, to infer causes and consequences of fire regime change over the past 10,000 y. Strong correspondence between charcoal-inferred and observational fire records shows the fidelity of sedimentary charcoal records as archives of past fire regimes. Fire frequency and area burned increased ∼6,000–3,000 y ago, probably as a result of elevated landscape flammability associated with increased Picea mariana in the regional vegetation. During the Medieval Climate Anomaly (MCA; ∼1,000–500 cal B.P. ), the period most similar to recent decades, warm and dry climatic conditions resulted in peak biomass burning, but severe fires favored less-flammable deciduous vegetation, such that fire frequency remained relatively stationary. These results suggest that boreal forests can sustain high-severity fire regimes for centuries under warm and dry conditions, with vegetation feedbacks modulating climate–fire linkages. The apparent limit to MCA burning has been surpassed by the regional fire regime of recent decades, which is characterized by exceptionally high fire frequency and biomass burning. This extreme combination suggests a transition to a unique regime of unprecedented fire activity. However, vegetation dynamics similar to feedbacks that occurred during the MCA may stabilize the fire regime, despite additional warming. Thanks for pointing out this important study and for starting a thread about it. Clearly a major set of feedback is well underway in a zone that has been storing 1/3 of all carbon in all life and soils--a major development, even if many of us suspected that things were moving faster most reports were indicating. And note that multiple feedbacks are underway there. "Climate change is likely fueling the larger and more destructive wildfires that are scorching vast areas of the American West, according to new research led by Michigan State University scientists." The recent Arizona wildfire was not included in the study. "Our findings suggest that future lower atmospheric conditions may favor larger and more extreme wildfires, posing an additional challenge to fire and forest management," said Lifeng Luo, MSU assistant professor of geography and lead author on the study. August 2012 saw 3.6 million acres burn in the region, the most of any August since 2000. However, there were only 6,948 fires in August 2012 -- the second fewest in that 12-year timeframe -- meaning the fires were much larger. Large wildfires are mainly driven by natural factors including the availability of fuel (vegetation), precipitation, wind and the location of lightning strikes. In particular, the researchers found that exceptionally dry and unstable conditions in the earth's lower atmosphere will continue contributing to "erratic and extreme fire behavior." "Global climate change may have a significant impact on these factors, thus affecting potential wildfire activity across many parts of the world," the study says. Full study: Lifeng Luo, Ying Tang, Shiyuan Zhong, Xindi Bian, Warren E. Heilman. Will Future Climate Favor More Erratic Wildfires in the Western United States? Journal of Applied Meteorology and Climatology, 2013 (behind a paywall). So you can't live in the west because it's burning up, can't live near the coasts, because their being submerged and are exposed to super-storms. What does that leave? Paducah? Great Lakes region of North America but not too close to streams and rivers so as to avoid the flooding from severe weather events. I already live in Chicago. Come up to Lake Superior. It will be a while before truly unpleasant summers make their way this far north. Sounds great. Got room for, say, a billion climate refugees? I kind of want to live in the Arctic areas that are warming fastest. Along with challenges come opportunities. I think whoever is in the right place at the right time with the right idea up there can become very successful. I don't think it will be long before a high tunnel can have a long enough season to grow a marketable quantity of produce. I'm still in school right now, but when I graduate I will be saving a portion of my income to buy land in Alaska or the far north of Canada. It might only be my children or even their children who get to benefit, but the New North will be a land of opportunity for some. Maybe picking a spot that just burned would be a good idea. That's one risk I don't have to worry about for a while. This seemed like a good place for a post about an article by the National Geographic on forest fires in the western US. ...Meanwhile, out in California—which did pass a statewide fire-mitigation law after a deadly 1991 wildfire—waits with baited breath for the rest of fire season. Meanwhile Sweden & Finland (and likely Norway too) aren't having any of that, as is usual when El Nino is developing. It just rains, and no temperatures above 25C recorded in Finland yet this summer, northerly winds have paused on occasion though giving people a chance to try only t-shirts and shorts for a day or two. speculation: Is it possible that the So. Am. drought and the rapid may melt/runoff has significantly impacted the AMOC off of Greenland, leading to regionally cooler temperatures in the nordic countries? I guess South American stuff doesn't much affect us here... , but Southern North American might. The correlation between developing Nino and 'bad summers' in Nordic countries is weak anyways. That said, I think you're correct on the AMOC thing as the change in weather here during early summer hasn't been in sync with the rest of the year, at least it feels so (haven't done any calculations, as the MetOffice of Finland does not give easy access to long periods of weather stats) . There could thus be two mechanisms in work here, one associated with the phase of ENSO (rising index -> 'worse' weather), the second associated with AMOC. The first would mediate itself through North Pacific and Arctic weather front rearrangements made by ENSO, and the other one with the said runoff. Anyway the winds have been pretty consistently from W-NE here all through the early 'warm' period of the year. Maybe the winds going N through Alaska and E Siberia come back down here. 2004 could be a year to compare. You just wait when Nino starts to subside and we start complaining about the (relative) drought, not that we normally have proper droughts here (f.e. on 2005 the lawn on the yard almost catched fire and there were recommendations to cut the use of water, it was terrible (not really)). Yeah you are probably right. I was considering the effect of a reduction in freshwater from the amazon leading to a slight increase in salinity causing some effect on the AMOC. There has been a significant increase in observed salinity in the North Atlantic Subtropical region. ah yes, (y) the Amazon droughts didn't come to mind. But that could be part of the cause for SW USA droughts, I guess. Now much of Alaska is abnormally dry, according to the U.S. Drought Monitor, conditions which have fueled over 700 wildfires that have ignited — many as result of dry thunderstorm lightning — since the beginning of the season. To-date, fires have burned over two million acres this year. 2004 was previously the worst wildfire season on record, when 6.5 million acres burned across the state. But 2015 is blowing that year out of the water, setting a new record for the month of June by an astonishing 700,00 acres. Whatever the number is, it sure is astonishing! It is 700,000, which is almost double the figure for 2004, but 2004 reached the same figure only four days later, so not all that astonishing if you look at it that way. I wonder if the folks gathering the data for that graph take a day off, or did nothing burn 'on' June 30, 2015 and very little burn on June 30, 2004? Not sure how they measure these things but I have to believe the accuracy is not good. Perhaps they get their information from the government's incident information site, which is not necessarily updated for every fire every day. Meanwhile (as I've mentioned elsewhere), Canada's seen 2.37 million hectares burned so far this year, which is more than double their ten year average for the year to date. Most of it very recent, with a big spike for last week and this week looking worse so far. Some Agencies have Extreme wildland fire hazard, fire load is high to extreme with a heavy fire load expected. Several Agencies are experiencing major incidents which have the potential to exhaust agency fire resources nationally. International mobilization of resources through international co-operators is likely. National resource levels are insufficient to meet occurring and anticipated wildland fire activity. Northern Hemisphere snow cover is near record lows. Here’s why that should worry you. Anderson said even if crews bring the Saskatchewan fires under control, they may not actually be out until the fall. "The large fires that are burning there will continue to burn until they are contained or until a fire-ending event may occur, and that may just end up being the first snowfall." Wildfire expert Mike Flannigan said tinderbox conditions that have lead to the destructive fires in the West can be blamed on climate change. "Our weather this year has been very hot, dry and windy," said the University of Alberta professor. "This is consistent with what we expect with climate change. I'm not saying every year is going to be a bad fire year, but we are going to see a lot more fire on the landscape." It is actually amazing how humans can so easily adjust to massive changes in earth behavior, a brief blip of stories and interest and then back to business as usual. For the past two weeks, Chicago has been plagued by massive high altitude smoke from the fires in Canada. If you look at that image of the eddy, it's pretty damn clear where it is heading. Our cloud free skies have been a dirty gray brown for most of the past two weeks. There were a few brief stories in the newspapers and on TV and then......oh well, the new normal. In 20 years, we will be able to fascinate our children as we tell them stories about the brilliant blue skies that use to hang overhead. In total, more than 10,000 square miles — roughly the size of Massachusetts — have burned in Canada. "The situation is Canada is extreme right now, specifically in Western Canada," says Kerry Anderson, research scientist with the Canadian Forest Service. "Western Canada has seen about three times the area that's normally burned for this time of year." 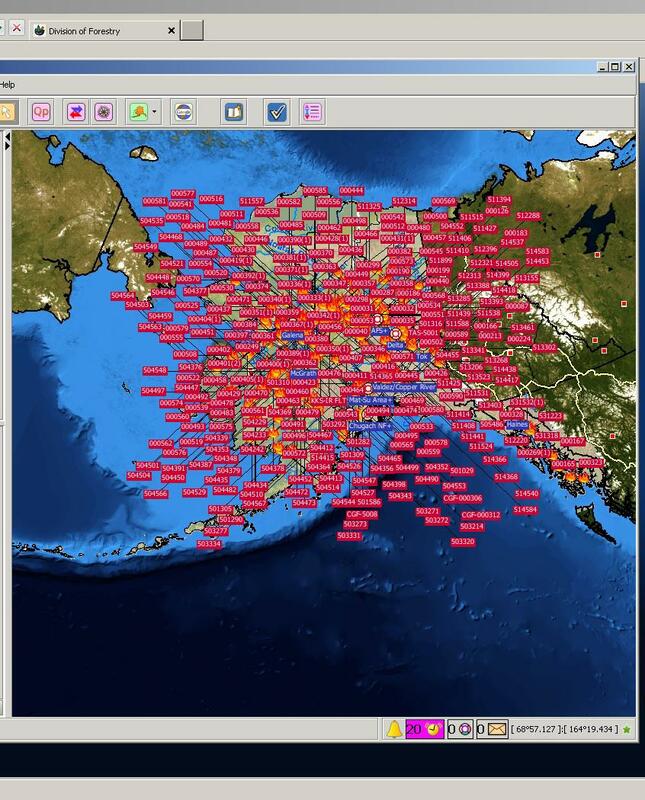 Alaska's fire season is off to a historic start as well. Record high temperatures in much of the state, combined with a three-day lightning storm, sparked more than 300 fires late last month. Those have since grown to burn more than 3 million acres. Link has article, photos and an audio version of the story. Nearly 5 million hectares have burned across Canada and the USA now (2.9 million and 1.9 million respectively). Not quite arctic, but just as important. The Paradise Fire isn’t just clearing away excessive growth, as an ordinary fire would do — it’s eating away at a centuries-old ecosystem. Flames carve out deep gashes in the massive trunks of ancient Sitka spruce, some of the largest and oldest trees in the world. The weakened trees smolder, then, with an ominous crack, topple to the forest floor. And the fact that the fire is downing so many trees is worrying to scientists, who fear that fires like the Paradise blaze might change the makeup of this primeval rain forest. The Sitka spruce, which has thin bark and a relatively shallow root system, is especially vulnerable, according to the Seattle Times. If the ancient trees are burned down, they may not be able to grow back and would instead be replaced by younger, newer types of trees, fundamentally changing the landscape. Extract: "The wildfire season has lengthened by almost 20 per cent in 35 years globally as the average temperature has risen, a climate change study says." [Science AMA Series] American Chemical Society AMA: Hi, I am Kimberly Prather, a Professor of Atmospheric Chemistry at UC San Diego. We fly through clouds and break waves in the lab to study how aerosols impact our clouds, weather, and climate. AMA! Hi Reddit-I am a Professor of Chemistry at UC San Diego. I hold a joint appointment in the Dept. of Chemistry and Biochemistry and also Scripps Institution of Oceanography. I have spent over 20 years studying the impact of atmospheric aerosols on air pollution, human health, and climate. Aerosols are solid and liquid particles suspended in the atmosphere, which range from soot emitted from cars and wildfires to natural sources such as dust and sea spray. Because of their extreme complexity, our overall understanding of how much they are affecting climate through interactions with clouds represents the single largest uncertainty in our overall understanding of climate change. Over the past two decades, my research group has performed field studies around the world on ships, aircraft, and in mobile laboratories aimed at determining the major sources of atmospheric aerosols. Most recently, by performing unique aircraft measurements inside clouds, we have directly determined which particles seed clouds and how different sources can affect precipitation. Surprisingly, we discovered that dust from as far away as Africa and microbes picked up over the oceans can affect the amount of snowfall over the Sierra Nevada mountain range in California. Yes, indeed aerosols from one continent can influence weather over another thousands of miles away! So feel free to ask me anything about aerosols, clouds, aircraft studies, our wave machine, CAICE, atmospheric microbes, and chemistry. Also, happy to discuss steps we can take to help our planet and my thoughts on the importance of communicating our exciting science findings to the public. Finally, I am open to discussing my own career path to becoming an atmospheric chemistry professor. I will be back at 1 pm ET to answer your questions. AMA!